We are currently expanding our workshop to include a new facilities - this revamp should be complete by Easter 2010. With some G40s, 20 years of service is just round the corner- so it will come as no surprise that certain components will require attention/refurbishment. Often overlooked, a healthy fuel system is a necessity before seeking more power. Polo Performance Parts can now offer a full injector cleaning service & diagnostic report for all Bosch/Siemens style injectors. If repairs are required we can also replace internal filters and pintle caps where necessary. 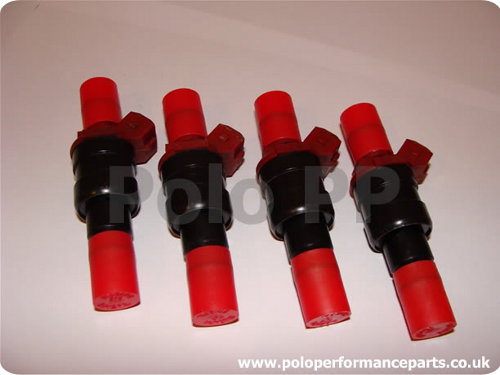 O-Rings are replaced on every set of cleaned injectors. £35/set (4) inc. return postage. Any further work required (I.E. Wiring fault diagnosis) will be charged at our usual labour rate of £20/hr. Cam timing can be done for an additional £25 using a DTI- you will need an adjustable camshaft pulley and the specs of your cam for this! To ensure you're getting the maximum potential from all your modifications we offer a custom calibration. A map tailored and tweaked on the road or a dyno of your choice (customer pays dyno costs) eliminates any flat spots, optimises ignition timing and ensures the A/F ratio is perfect for maximum power. Our mapping kit includes detonation detection instrumentation, and exhaust gas temperature monitoring, along with wideband A/F tracing. To ensure that your car not only produces maximum power and torque, but does so safely with no risk of damage to the engine. N.B It is advised that a full set-up is undertaken on the car prior to any calibration work to ensure no time is wasted.